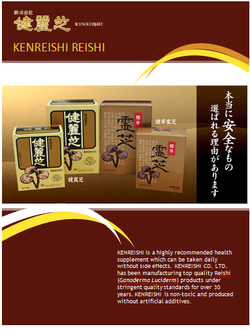 Benefits of Reishi - Mom (♥) Reishi! and Japan. Currently in Japan, the artificial cultivation techniques are well established has become the finest available Ganoderma. Triterpenoids and β-glucan is a major component, in addition to plant sterols, amino acids and minerals. The following table was found in a published article titled Medicinal mushrooms: their therapeutic properties and current medical usage with special emphasis on cancer treatments  from Cancer Research UK . 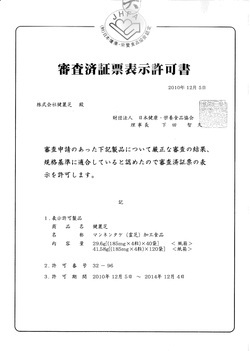 KENREISHI is certified by the ”Japan Health Food & Nutrition Food Association"(JFHA) certification mark, and only products that have passed a strict examination is permitted to display of the quality mark as shown below.